Located in a lovely picturesque village, near Limoges, easily accessible, this 18th century farm was fully renovated with great taste. 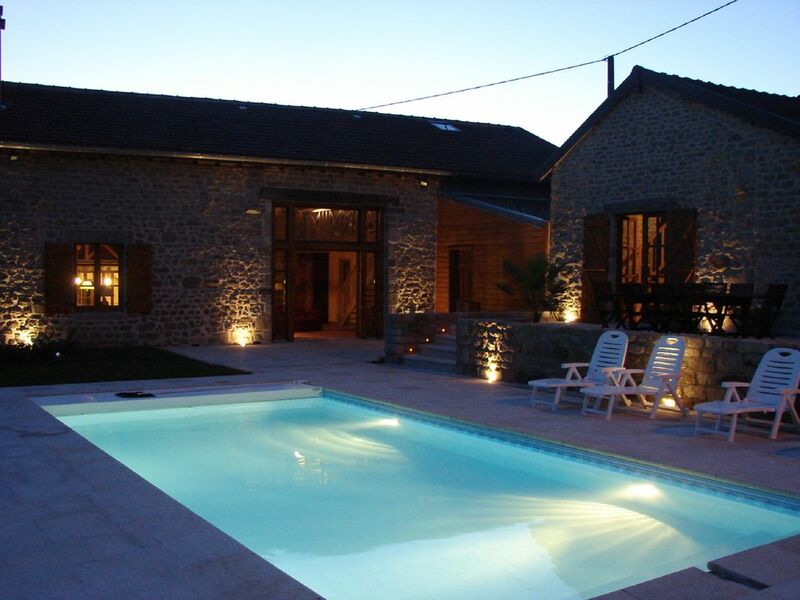 On 320 sq.m in addition to its outbuildings, the Gite de Chabanne can welcome in optimal conditions groups (14 sleeping arrangement), with or without children, in any season. High class services and equipments (see below). Relax by the fire, under the lime tree, or enjoy some activities on site or very close. There are various: magnificent hikes on marked trails, cycling, fishing, horse riding (riding centre of Ambazac 7km away), golf (4 golf courses 45 min away), the castles of the region, the Perigord and the Dordogne nearby for excursions. The town of Limoges is near with its activities, the St-Pardoux Lake is 5 km away with its beaches, slides, sailing, water skiing, and fishing. Our references: our welcome and our assistance for a memorable stay, adapted to your tastes. The Limousin is quite unknown but very rich and magnificent. It is worth a long stay. Like the Perigord and the Dordogne nearby, the valleys, the forests and the lakes make the charm of the Limousin. There are small picturesque villages around trails. The Gite de Chabanne is at the heart of this region, on the A20 motorway (exit 26) 10 min to the North of Limoges in the Ambazac Mounts, one of the most beautiful sites of the department. Very easy access (the airport and Limoges are 10-20 min away), the small village is adorable and very near the Crouzille Lake. The shops of Ambazac are 5 min away. The A20 motorway leads us to Paris in 3 hours and to the heart of Dordogne in 1 hour. There are several castles very near (Coussac, Bonneval, Chalusset, etc.). The Limoges museums and the visits of porcelain workshops are 15 min away. The huge lake of Vassiviere is 45 min away. Chabanne is ideally located for relaxation holidays in any season.